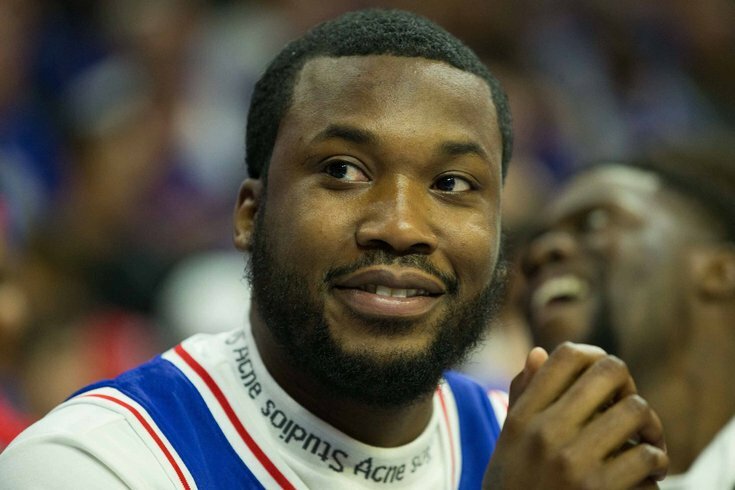 Meek Mill, courtside at the Sixers' Game 5 win over the Miami Heat. Meek Mill, Jay-Z, Sixers owner Michael Rubin, Patriots owner Robert Kraft, and CNN commentator Van Jones announced a new organization Wednesday that will lobby for changes to state probation and parole laws across the U.S.
Jones will be the CEO of the organization, called The Reform Alliance, which Rubin said at an announcement event Wednesday will dedicate $50 million towards its efforts. “With this alliance, we want to change outdated laws, give people hope and reform a system that’s stacked against us,” Mill said at the event, per the Associated Press. Mill himself is currently on probation. He was released from jail after five months last spring, and is free while his case goes through the appeals process with the Superior Court of Pennsylvania. "I spent time with men who had 28 months in prison for $100 bail. They weren’t even found guilty for their crimes, but $100 kept them in prison. The taxpayers had to pay money to keep guys like this in prison, and it was for a petty crime. Things like that never made sense to me." Mill released his fourth studio album, “Championships”, in November.